9/27/99; Tach time is now 22.9 hrs. Today I had the prop dynamically balanced. This resulted in a dramatic reduction in the roughness I have experienced at a couple of rpm ranges. The service was provided by Jim Gaither of Dynamic Balance Service, Inc (1630 Faircrest Drive, Hueytown, AL, 205-491-6660). 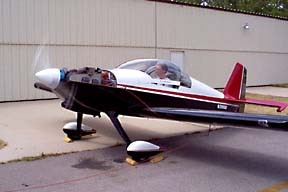 Jim arrived in his duelie to balance not only the prop on my plane, but also the props on an RV-6A and RV-4. Jim stated that he balanced nearly 1000 props last year, many of them RV's! 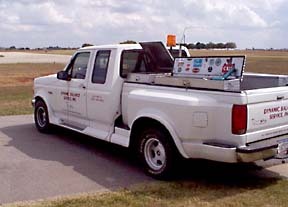 He uses the Chadwick 192A system, and is an approved FAA Repair Station. The Chadwick system measures the velocity-inches/second of displacement with the engine running at 2000 rpm via a sensor attached to the crankcase. The Chadwick plots a graph showing the displacement due to crankshaft/prop imbalance and also camshaft rotation. The system confirmed that 399SB was quite a shaker, and while the initial readout was pretty high, Jim assured me that I would definitely notice an improvement once he completed the process. The prop is new and should be in very good static balance, but I suspect that some cylinder repairs on the engine listed in the logs may have resulted in some unmatched pistons finding their way into my engine. The above plot shows the first run in red ink (peaks at .60 ips, a rather high reading). 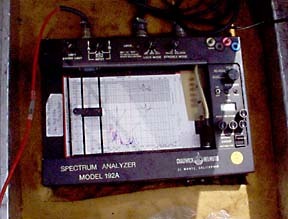 By the way, the machine also provides a tach check (2004 actual rpm at 2000 indicated, a tribute to the accuracy of the RMI uMonitor). You can see two peaks, one at 1000 rpm and the other at 2000 rpm. The 1000 rpm spike is the camshaft running at 2X crank speed. 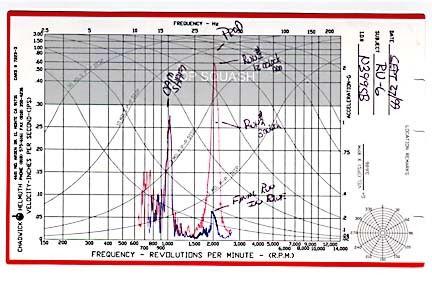 Jim said the camshaft plot indicated that the camshaft lobes were in good shape and showed normal readings for a mid-time engine. 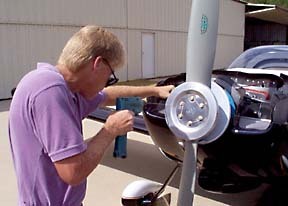 A strobe is shot at the prop and indicates where the corrective weights should be placed on the spinner bulkhead. Following the first run, Jim attached washers under some of the spinner screws, and the engine was run again. You can see the second run as the heavy blue line on the graph which indicates .06 ips. I knew as soon as the rpm came up that a drastic improvement was evident. The guys standing nearby said they could hear the difference in the exhaust note! After some final calculations, holes were drilled in the spinner backplate and washers were attached with AN hardware. The other RV's also required some weights even though they weren't as out of balance as my plane (matter of fact.......some folks have even gone so far as to consider the pilot of my plane as being out of balance....). The RV-6A had always been regarded as a very smooth plane, but it received a few washers as well. Ok, you are convinced of the value of dynamic balancing, but what does it cost? Having a smoother-running powerplant set me back $200 and less than an hour of my time. No doubt there will be fewer instances of material fatigue on the airframe, and 399SB has become a much more hospitable place to spend quality time. 10/1/99; N399SB now has accumulated 25.0 hours and is free to go when and where she wishes. I suppose this is a logical place to end the twenty-two month saga of how several crates of aluminum parts became a fully commissioned aircraft. In actuality I realize that the saga has just begun since no homebuilt aircraft is really ever finished as long as it is in flying condition.